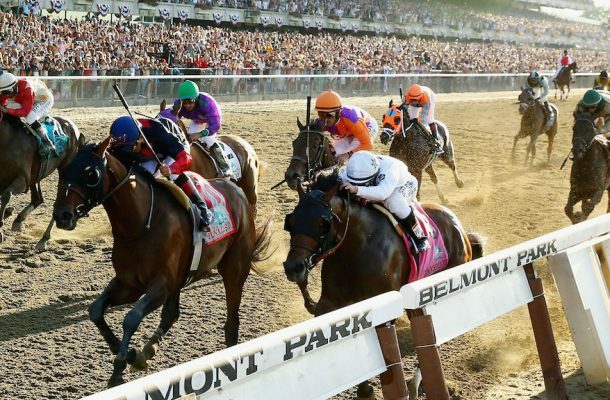 Saturday, June 10 offers a huge card of horse racing action at Belmont Park in New York highlighted by the final leg of this year’s Triple Crown racing season for three-year old thoroughbreds with the running of the $1.5 million Belmont Stakes. The elusive Triple Crown title is no longer up for grabs with a pair of different winners in this year’s Kentucky Derby and the Preakness Stakes, but that does not mean that you cannot capitalize on this third jewel with a big effort promoting this year’s Belmont Stakes. The fact that Derby winner Always Dreaming and Preakness winner Cloud Computing are not even in the field for Saturday’s main event at Belmont Park should actually be seen as a positive for anyone looking to bet on the race. The gap between the morning line favorite and a few good looking longshots is not all that wide, so there is some money to be won if an entry at longer odds does go on to upset the field. There is also quite a bit of money to be made by you as the one booking the action for this race if you build out your betting board accordingly. This is the last chance to reel in some extra action from the casual horse racing bettors that only place wagers on Triple Crown events. More importantly, it is an even bigger chance to establish your online bookie business as one with a full-service racebook offers an extended slate of betting action every single day at all the tracks running a daily card. You may make the bulk of your company’s profits taking in action on sports such as football and basketball, but other than an online casino, horse racing is the only other online gambling activity that is up and running every single day of the year with the possible exception of Christmas Day (although last year there were some multi-million races on the card that day in Japan). Running and managing your own sportsbook is hard work in a very competitive business environment so there is no such thing as making ‘easy money’ as a private bookie, but pocketing some bottom-line profits on added action for horse racing is about as easy as it gets. There is life after the Triple Crown races and in reality these three events basically mark the start of a summer horse racing season that offers major graded events almost every Saturday at top tracks such as Churchill Downs and Keeneland in Kentucky, Santa Anita Park and Del Mar out in California and Aqueduct and Saratoga in New York. There are literally dozens of other race tracks running a daily card during the summer months and all of this racing action can help you build your summer racebook into a very profitable added stream of revenue. One thing to keep in mind is that it is going to take some hard work on your part to make your horse betting racebook a serious part of your overall bookie business. Not only are you competing against the big offshore sportsbooks operating an online racebook, but against a number of online and off track betting outlets that will go to great lengths to attract horse bettors to their websites or actual brick and mortar locations. Do not get discouraged if things become a slow go at first since effort and persistence will pay off in the long run. The most important thing is to let both you current and potential sports betting customers know that you are taking action on horses. From there, some promotional campaigns along with an online marketing plan will keep things moving in the right direction.